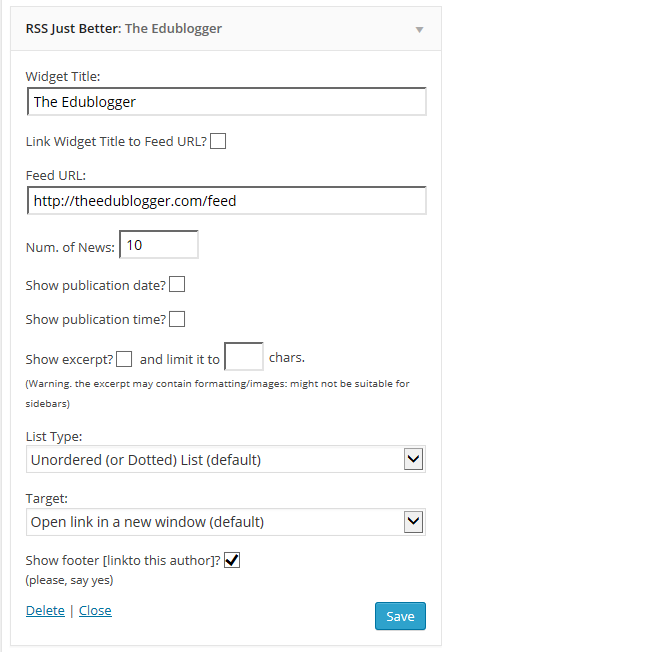 RSS Just Better Widget is used to display RSS feed from any website in your blog’s sidebar. It is added to Appearance > Widgets when the RSS Just Better plugin is activated in Plugins. 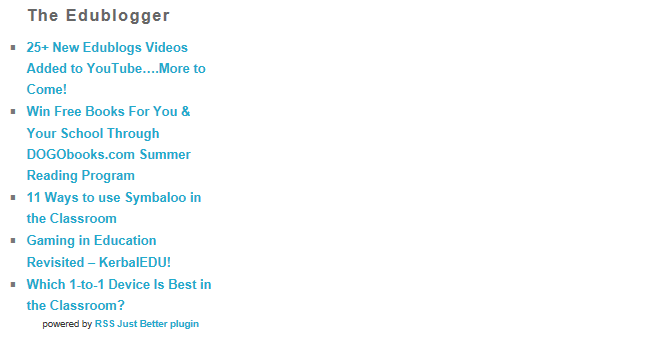 Refer to the RSS Just Better support page for more information on adding RSS feeds to posts, pages and your sidebar. Title: Allows you to add your own custom title. For example, Latest Science news. Link Widget title to Feed URL? : When selected it links the widget title to the Feed URL. Feed URL: The RSS feed URL for the website. Feed URL on a website is normally indicated by the orange RSS icon or the words RSS. Num. of news items: Controls the number of items displayed. Show publication date? : When checked it displays the date the article was published. Show publication time? : When checked it displays the time the article was published. Show Excerpt? : When selected it displays an excerpt of the post under the post title. Limit characters is used to specify the number of characters displayed in the excerpt. Show footer? : When checked it displays a link to the RSS Just better plugin page.